The legend says that in a distant part of our galaxy, thousands of years ago, humans lived on a planet called Kobol. Then, there was an exodus and humans inhabited a group of planets known as the Twelve Colonies. Caprica is an Earth-like planet belonging to the Twelve Colonies. It hosts the federal capital of the colonies. Caprica city. A futuristic metropolis... with pigeons!!! On Caprica, humans lived with an advanced technology level and created a cybernetic race known as the cylons. At the beginning cylons and humans lived together in peace and joy but they followed the same path towards a ruined relationship: while their romance was a comedy.... their marriage became a drama. Mr. Adama Jr. A pigeon-maniac. Anyway, we are not going to focus on the cylon-human relationship but the human-pigeon one. We will see that this is also another drama. 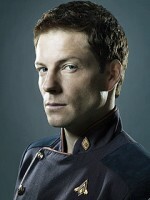 One of the main characters in Galactica is Mr. Lee Adama Jr. At the beginning he is captain of the colonial fleet but later he becomes Vice President of the Twelve Colonies, having an active role in the series. In some way, he is a hero…. but a hero with a dark past and a hidden hatred. In the picture on the left side, we can appreciate a spark of rage in his eyes. During his youth (in the episode this is shown in a flashback) he arrives completely drunk at his apartment and finds a pigeon inside. Without thinking twice he grabs a broom and tries, unsuccessfully, to scare away the poor animal. In this case, his military training didn't help to solve the situation. It is very interesting to note one fact: humans emigrated from Kobol to Caprica… and they took all the valuable items…. technology, spaceships and pigeons!!! Actually, there are very few animals in the complete series and it is very remarkable to see as an exception, the pigeon appearance. The complete scene can be seen here. 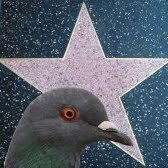 This is the first example in this blog of an unearthly pigeon. Are pigeons actually spread all over the universe? Pigeon flying with wings fully extended while keeping an eye on Mr. Adama. Jr.
Pigeon observing Mr. Adama. Jr. It can't understand the hostile welcome that it receives. Mr. Adama Jr. is prepared to attack the innocent pigeon. The proof of the evil aggression of Mr. Adama Jr.
Pigeon activity: It is a typical urban pigeon which enters inside the apartment of a pigeon-maniac guy. It suffers a very hostile attack with a broom. I would like to remark that the pigeon suffers actual harm and we can see that it is very scared. This scene reaches levels of real violence that are comparable to the ones found in Borat. Symbolism: The pigeon is used to highlight that the supposedly honorable character has several weaknesses and he is not honorable at all. Relevance: Low. The pigeon is only used to describe with more depth one of the characters. Training level: It is a stunt pigeon that suffers a real aggression and safely escapes. A very risky interpretation. 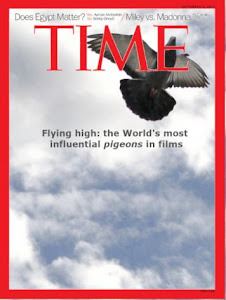 Wow, I'm glad there are pigeons who risk their lives like this to make a movie better! Great pigeon 11/10!